Great condition with teak rails/eyebrows newly restored. The sails are the original with a jenny and hank on jib that I've only used once. I would like to sell to a person who has an appreciation for these fine cruisers. 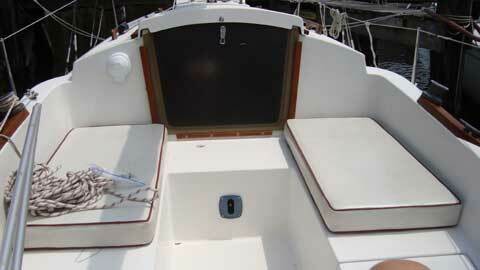 Two cabin layout for privacy, a 27" deep shoal draft keeland a kick-up rudder. Good boat for gunkholing. You will find adequate storage space (2 lockers), a generous size v-berth (6' wide x 7' deep for 2 adults, and 2 setties, each provide sleeping berths 8' long. There's a port-a-potty compartment w/ privacy curtain, a removable interior bulkhead mounted teak dining table. A sink to starboard and an alcohol stove to port are cleverly designed to slide out of the way beneath the cockpit's seats when not in use. 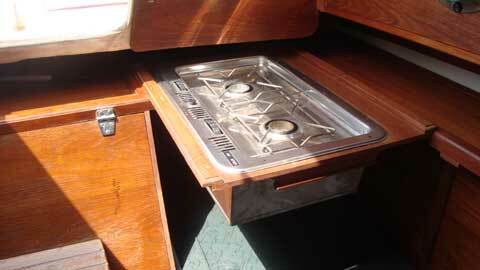 A locker in the v-berth holds a 6-gallon tank with a hose that leads to the sink. The six bronze opening ports, large foredeck hatch and companionway provide generous ventilation. 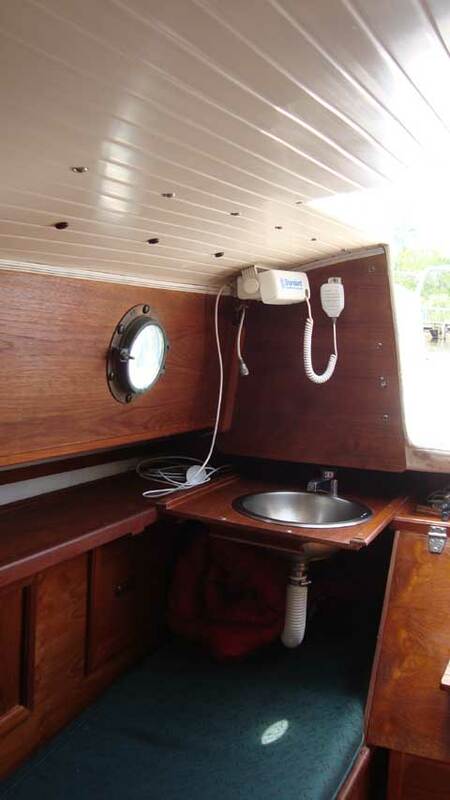 A handmade mahogany screen for the companionway is provided. Extensive hand finished teak wood trim inside the cabin, which is in very good condition, as it has been oiled 2-3 times/year. The cushions are in brand new condition, but 10 years old. There are 3 cabin lights, a teak holly floor and white planked molded fiberglass ceiling which give the feel of tradition and coziness. 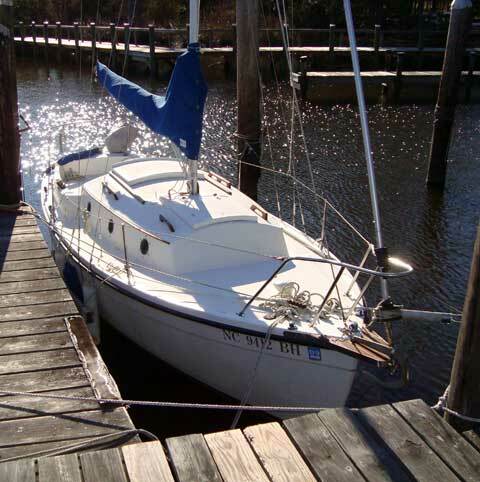 The large foredeck w/ stainless steel bow pulpit and wide sidedecks and cabin top make moving around, handling sails, easy. The royal blue Sunbrella sail and tiller covers are in new condition. 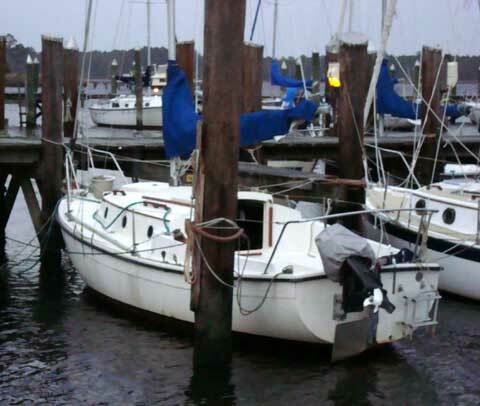 There are 3 cleats on the bow, 2 brass winches with 2 cleats, and 2 cleats at the stern. The tiller is two tone maple. There's a bag for the jib, and a cover for the outboard engine. The large 7'2" self-bailing cockpit provide generous room for four-six guests. There are no through-hulls, seams, centerboard or separate keel to fail. When docked the kick-up aluminum rudder, and the engine are completely out of the water. The deck has core material over 100% of its surface for rigidity and insulation. With her 27" draft and 7'10" beam, the Com-Pac 23 is trailerable. The original anchor chain was replaced with a larger one. David, thanks for taking the time to advertise my compac.